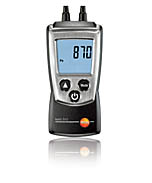 Testo 510; differential pressure meter incl. protective cap, batteries and calibration protocol. The differential pressure meter is ideally suitable for pressure measurements in the range 0 to 100 hPa. testo 510's differential pressure measurement is temperature-compensated for accurate readings. Readings can be displayed in Pascal over the whole measurement range. Magnets at the back of the instrument enable hands-free operation, for instance, while adjusting gas heaters.